In an idle moment of reflection we worked out that this show was the 50th consecutive full house for us at LRB. This is something we are very proud of and we would like to thank everyone for their attendance over the time. We could not possibly put these shows on without you all. 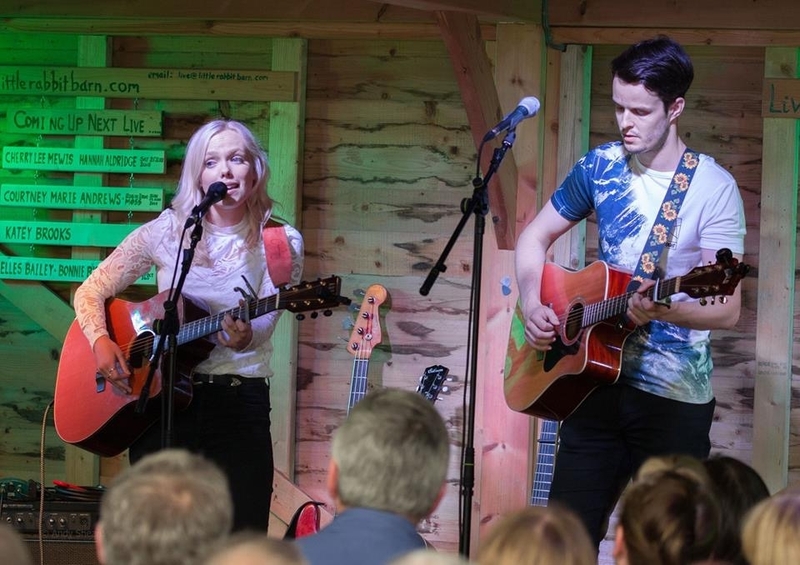 The plight of small venues managing to stay operational was recently highlighted by Elles Bailey along side the release of her LIVE AT LITTLE RABBIT BARN, limited edition CD. The associated press coverage highlights the importance of a vibrant independent live music infrastructure across the country for musicians and fans alike. So your continued support for us at LRB has been invaluable. Again, thank you all. 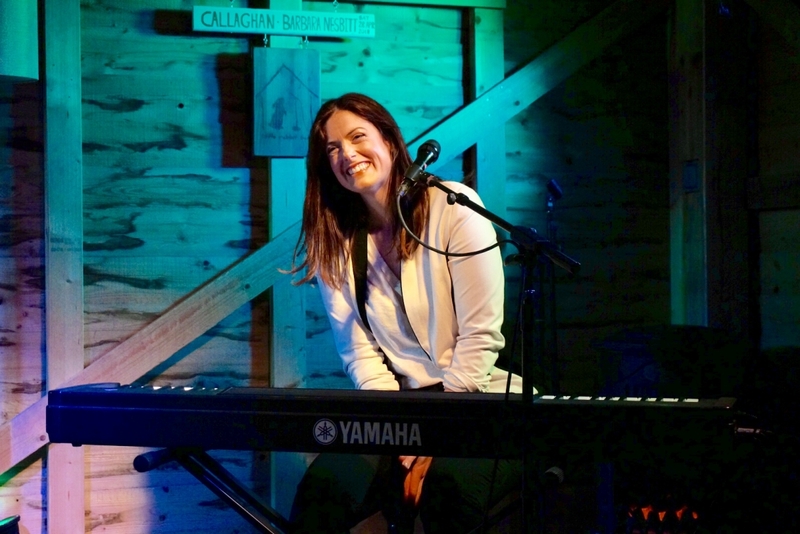 Tonight, despite the rain hindering the set up, we were very excited by a welcome return to the newly expanded LRB from Barbara Nesbitt and a first visit for Callaghan on the last night of her 2018 UK tour. First up, Barbara Nesbitt with Ben Jones (not the Ben Jones character in the Midsummer Murders UK TV series) haha... on Guitar and backing vocals. Ben hails from Sheerness and now lives in Austin Texas. He is a very sought after musician in his own right and recently toured with Brian Wilson in the UK and USA. For Ben, a dream come true. Lights, Cameras, Action! Barbara tentatively plays along with the incidental music before Jonathan’s introduction. “My Mamma told me to have a good time wherever you go as you probably won’t get invited back, so it’s good to be back among music lovers here at The Little Rabbit Barn”. Says Barbara setting a fun tone for her set. Done all I can do was the opening song where we had our first taste of Ben Jones on Guitar to an appreciative applause for his lovely playing. “Ben plays with his own band ‘Beat Root Revival’” who Barbara urges us to check out. I found their self titled album on Tidal and can confirm it is worth seeking out. “Next is a song about a break up but surprisingly optimistic for me” 100 Times. Eve Selis gets a mention and Barbara is surprised to learn she has played LRB seven times before. Eve also plays with Jeff Berkeley and Calman Hart who suggested Barbara writes a love song for once, where it works out for everyone; “But you gotta write about what you know, don’t you? It has the word ‘Love’ in it though”. So now we get to enjoy Never been in love from ALMOST HOME. Barbara’s 2013 release. The lyric says it all. It’s a great song and a true story we are told. Ben sparkled on Guitar again in the mid section. Barbara was effusive in her thanks for everyone involved with keeping the LRB running. “Back home, we work with a loose outfit of songwriters but we don’t get to meet much, with being so often on the road. So we set a theme and all write a song about it and then compare ideas. The theme was ‘At Large’ and out of this project came At Large in Tennessee, a song about a friend who got her divorce, finally! She needed to”. This is the opening track on RIGHT AS RAIN. What Could Be Worse was next, another heartbreak song with an uptempo feel. “When you’re happy, excited and having a good time it’s hard to find time to write about it”. Says Barbara, although we are having a great time tonight and I’m writing about it, but we know what she means. “I write breakup songs, relationship songs and making poor choices songs, but I also write Murder Ballads” Barbara tells us. “They are not necessarily related, but I wouldn’t [censored] with me”. laughs... Just kidding! “No one has better ways of telling people off than the English. Lovely expressions but I can’t repeat them tonight”. Laughs... “I started writing this song last time I was over here, track 3 on the new record RIGTH AS RAIN. “It’s called Red”. “Songs about killing people” Shouts Barbara above the applause at the finish. “Lets do Josephine”, calls out Barbara, keeping the momentum going, “alright” replies Ben as they launch into the song. Barbara had a friend called Josephine in the front row but assured her it wasn’t written about her. 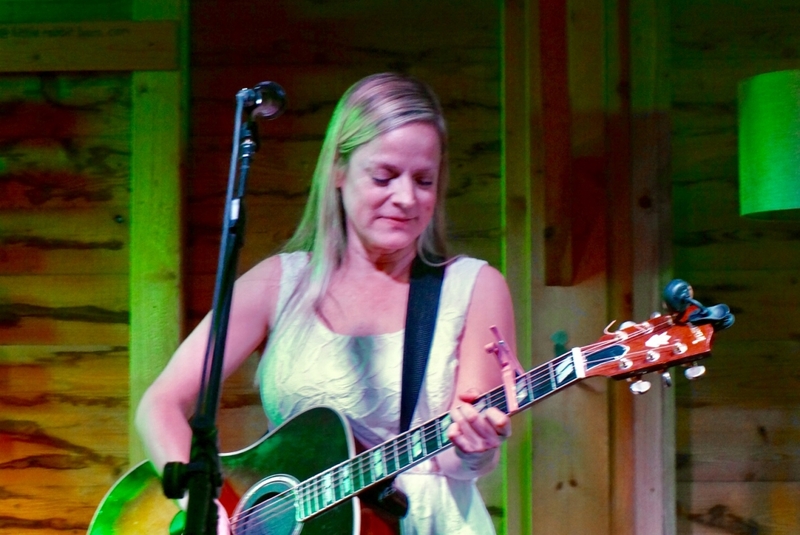 Laughs ... More great uptempo Americana music that just goes down so well with people. “I want to stay here for ever” says Barbara excitedly as she accepts more well deserved applause. We have been hearing some new songs tonight that are not on the latest record and it looks like Barbara is going through a very fertile writing phase just now, another reason not to miss these shows, you get to hear songs first and as they develop. “Mirror Mirror is a new song written for people who don’t believe in themselves when others around can see their worth & talents clearly”. Explains Barbara. Wow! that’s an extract from a great lyric and the melody is one that stays around in your head once you have heard it. Great songwriting. 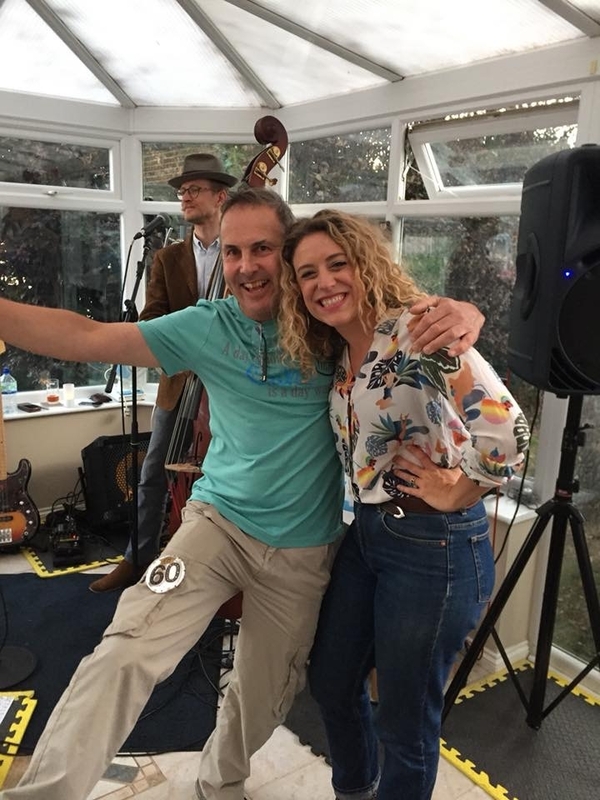 “It’s been great to share the stage with the Uber talented Barbara Nesbitt” says Ben… and you can see they are both thoroughly enjoying themselves. “In the South East part of the USA we have funny colloquialisms like ‘Bless your heart’, but it doesn’t mean that”, laughs... “it’s how you say it”. Another one is ‘Old Devils Never Die’. “But according to my Aunt Peachy”, says Barbara “Its not true, Old devils can die”. “I’m pretty sure there are bodies buried in her yard”. Laughs... “She was a great lady who inspired this song”. Old Devils can Die. Track seven on RIGHT AS RAIN. We enjoyed another guitar blast from Ben during the song as their magnificent set came to a close. “Barbara Nesbitt, a true Americana Gem” announces J as the LRB crowd show their enthusiastic appreciation for a great performance. Barbara Nesbitt was surely at the top of her game tonight. Time for the food break thanks to Lyn and her team. “I know it’s easier to do a rice dish, but I’m fed up with it” Lyn told me. so tonight we had Chicken in BBQ sauce with baby new potatoes and the feedback from guests was great. We even had a choice of deserts. What more could you possibly ask for on a night out. 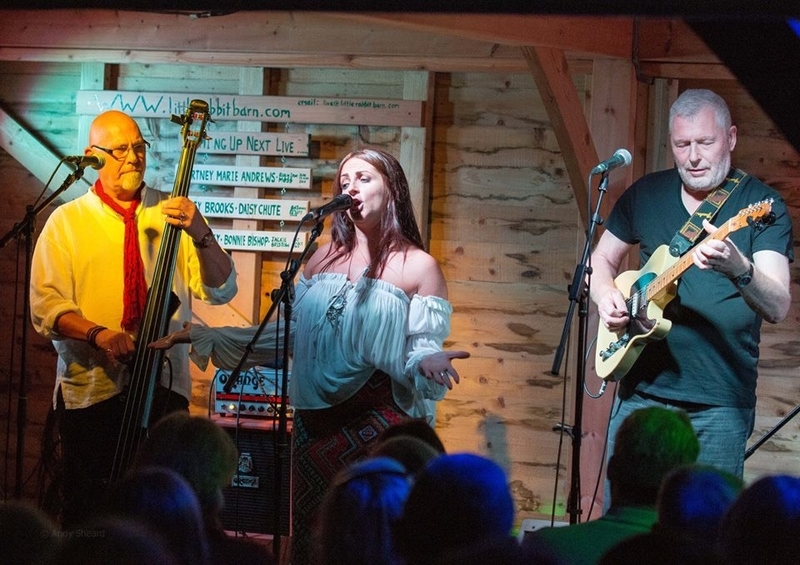 Great music, great food, great company and the Little Rabbit Bar to tempt you? Well, we also have the raffle with some great prizes to lead us nicely into the next round of live music. 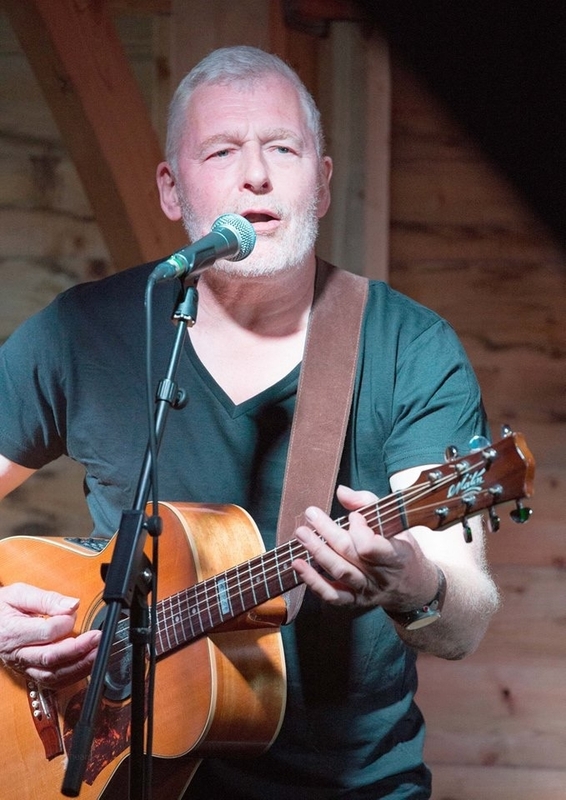 “From the Bush hall in London hosted by Bob Harris to The Little Rabbit Barn we are delighted to welcome Callaghan”, J proudly announced; and who can blame him. He and Lyn have put in incalculable amounts of time and effort to be able to present such quality artistes for us all to appreciate and enjoy. Opening with Surrender Callaghan sat at her piano with Dan Snyder on Keyboard and we were treated to a masterclass in vocal purity. Nothing less. Callaghan introduced Dan Snyder and then declared that she is a big big Rabbit fan and was finding the LRB and its resident rabbits (Benedict & Florence) the perfect way to end this tour. “If you want to sing along, click your fingers, drink along, now is the time as you may well know this one” Says Callaghan. Stand By Me. The Ben E. king, Jerry Leiber and Mike Stoller classic, made even more famous by John Lennon. Beautifully delivered before we were all invited to join in on the chorus. If you come to an LRB gig, you’re in the band. “It’s nice to come back to the UK to see the family and this is a song I wrote for my nephew when he was a baby, it’s about the hopes and dreams we all have. His name is Noah”. Noah’s Song Track 3 on A HISTORY OF NOW. Callaghan continues “This next song has a story about it, from how I went to the USA for a year that has turned into 8 years. When I first moved to Atlanta I stayed with a family whose grandmother told me stories about her life including when she fell in love at 17. The relationship didn’t last but she never forgot the feeling and that boy even 70 years later and having had a great life. This has inspired the next song”. When You Loved Me. This proved to be one of many pin drop moments as the songs close. Marvellous. From the first EP and Track 8 on the Album CALLAGHAN we have Solid Ground. “The next one from the new EP called SKIN ON SKIN includes a chance for audience participation. Any secret whistlers, this is your time to shine”. Better Together track 3 on CALLAGHAN. The LRB choir did a fine job here even without rehearsal. Back to the piano now for a song from CALLAGHAN’S ACOUSTIC COFFEE HOUSE. “Recorded in a similar situation to tonight with a stripped down performance”. Callaghan tells us. “My mother took me to see John Denver when I was young and I decided to record Annie’s Song”. “Which is my favourite song of John’s”. Again another pin drop moment that drew a huge appreciation. “Now we have a brand new song off the album. This was inspired by a dream where I had a conversation with someone I have lost. It all felt so real and on asking others, they had also had this same amazing experience. I think that even if somebody is gone, they are not really gone from you”. If You Miss Me. Track 12 from CALLAGHAN. Next “This is the title track of the new EP SKIN ON SKIN about the importance of connecting with people face to face in the age of social media”. Skin on Skin. 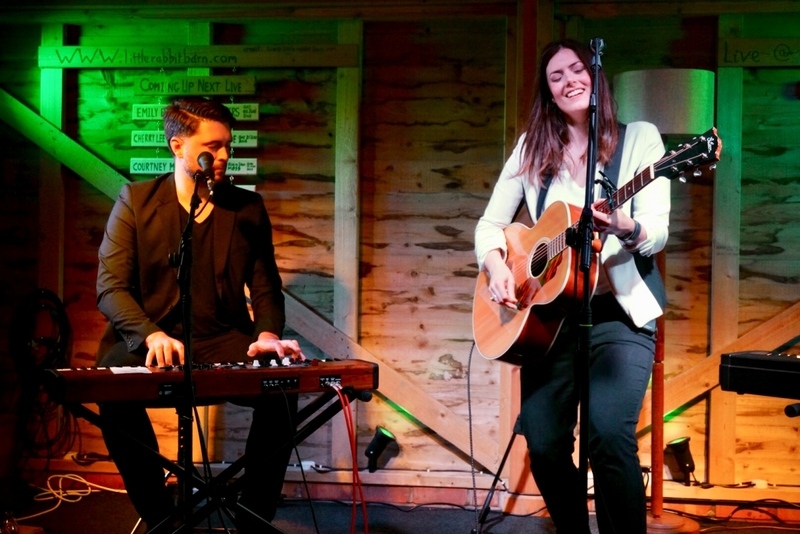 “The next song also from the latest EP was recorded with a gospel feel”, Says Callaghan. “We were fortunate to employ Lewis Price, a past lead vocalist from the Temptations and the Drifters, and an amazing singer, listen out for him on the recording. Its positive song about keeping going with a less than positive title The End Of The World”. Track 2 on CALLAGHAN. That was beautiful as Callahan’s voice drifted across the barn. A shout out to Barbara Nesbitt followed. More applauses. “This next song took me across the pond, so I re-recorded it for my second album. It’s a bit of an anthem for me now. I have been to 47 states now with only Alaska, Hawaii and North Dakota to do. That will be some tour” laughs... “Dan has been to all 50, but he was born over there is his excuse”. Laughs... “BBC Radio 2 got behind the song and made it possible for me to come back and tour here in the UK. It’s called Best Year”. ‘I feel good time coming, I see the sun rising’, is the lovely lyric that’s so easy to sing along to. “We are on our last song tonight, but I’ll let you in on a secret” says Callaghan. “If you go crazy at the end, maybe I’ll do another”, she says to knowing laughs all around. She is playing some festivals this year including The British Summertime festival in Hyde Park on the same bill as Paul Simon and James Taylor. “How can I meet James Taylor” She asks “I’m formulating my plans as I am such a big fan”. I for one think that if he hears Callaghan perform like she did tonight, she won’t need to make any plans for the meeting. We don’t need to change the world is next. A positive song about having more fun and worrying less with audience participation at the end. Singing along and clapping, we are all in the band again for the big finish. Thanks must also go to Dan Snyder for his lovely supportive playing as we all applaud for more whilst J comes up to sing? Nope, he is reading out his thank you notices. This next song was a stunning highlight to the evening as Callaghan, solo on the piano, played Over The Rainbow after offering her personal thank you’s to all. Written in 1939 by E.Y. Harburg and covered by so many people, “it is my favourite song” she says. Wow! That was a genuine showstopper and as I was told later, moving people to tears and ending the evening with another well earned standing ovation. The sound tonight was exquisite and overseen by Simon Allen and his team. Edited by ChrisLayerUK; 2018-05-01 06:34. I have been waiting for consent to share this with the world for a while now, but, finally, it’s out. Edited by ChrisLayerUK; 2018-05-27 09:17. 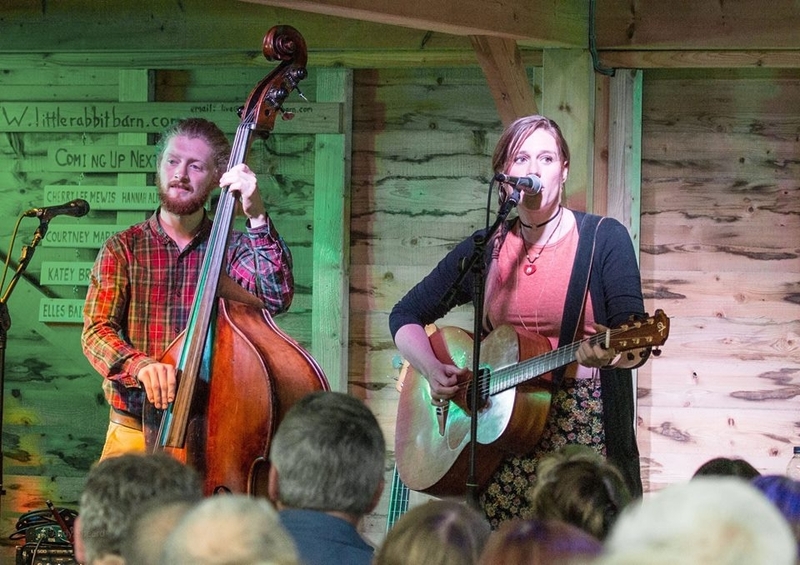 Here is Emily at The Quay Sessions. It was after the recent Gretchen Peters, Kim Richey gig at The Apex that a lady (let’s call her Emma) approached me to say “You’ve spoiled concerts for me!” “Why?” I asked, somewhat puzzled... “Well; music at gigs never seem as exciting as it sounds at The Little Rabbit Barn!” came the reply... Perhaps that is the greatest compliment we will ever receive and tonight’s gig with Emily Faye, Hollie Rogers and the sublime Emily Barker certainly lived up to this expectation. Bob Harris played this next song on his show recently, Giving in. Track 2 on Emily’s HERE I AM EP. Emily tells us how she overcame writers block by challenging herself to write a song a day for 31 days which led to only one finished song. Me For Me, Track 4 on the EP. There is no substitute for putting the work in it seems... Michael played a lovely extended guitar break here. Emily puts her guitar away for this next song, a catchy little tune called Game Over, which finished with another guitar flourish from Michael. Barefoot was next, just a lovely summer song about going barefoot says Emily. This suited today’s weather perfectly. It had a great off-beat catchy rhythm that caught the attention of the audience as Emily had them clicking along to the laid back beat. More great guitar from Michael Clancy. The next song was only its second live performance, written with Michael Clancy for all their friends. Leave It With Me. Next up after a quick UAP (underwear adjustment period) and stage re-set, with endorsements from Nick Mason and Suzanne Vega and being a Cafe Nero artist of the year, we are proud to welcome Hollie Rogers with Thomas Holder who sported a beautiful looking (and sounding as we were about to find out) double bass. Hollie admits that she has not been to the LRB before and didn’t really know what to expect. “I thought there would be more rabbits?” laughs… It appears she did meet Florence though. The next song is S.R.S from the BODY TO GROUND EP followed by a new song, Bring me some peace. “This next song is about the road from Penzance to St Ives which is a spectacular drive and it’s called The Coast Road.” That was lovely gentle song invoking images of Cornwall and a rare opportunity these days to drive a great road on a sunny day. “I’m learning to play the piano at the moment, but I don’t play it in public often although I do write on it.” Hollie tells us leaving her guitar aside to sing When I Was Young. Nice! Hollie, now back with the guitar says. “We shot a live video of this next song in THE POOL, a studio in South London that used to be an old swimming pool. This is a striped back version of Criminal Heart.” You can find a link to the video on Hollies Facebook page. Of note; Lukas Drinkwater who often plays with Emily Barker (More Later) played on that very video. Lukas is, like Thomas Clancy, another great multi instrumentalist as Tom aptly displayed tonight. It never ceases to amaze me as to how big a sound you can get from just two talented musicians. It’s also hard to describe those Pin Drop moments that make your spine tingle. You cannot convey it in words, you need to get to the gigs. New Religion is next as Tom bows his bass to great effect... and then to finish we have, after a few more thank You’s and Hollie expressing her fears for the journey home as to the effect of Tom finishing the Egg Sandwiches in the green room... laughs... Carter. The first song from Hollies first album. Well, that certainly brought the house down as we go into the food break. Lyn is a wizard with the food. Can women be wizards? I won’t call her a witch and I know very little of the magic she uses with her team to produce such culinary delights, but there it is for us all to enjoy. Amazing! We also have the raffle to top it all off in true English style. Little Deaths opened the show, track 1 on THE TOERAG SESSIONS. 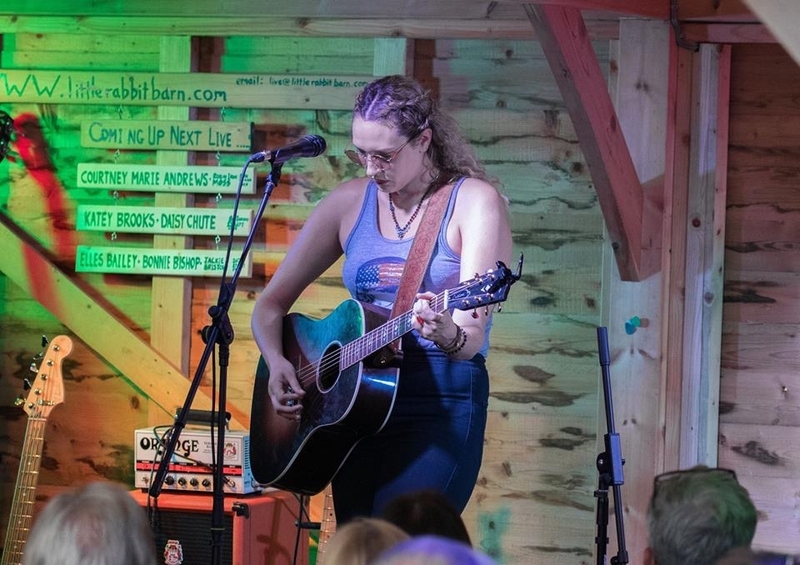 Emily, on stage and spot lit playing her acoustic guitar at the Little Rabbit Barn is a sight and sound to saver... you could say she started it all. Now a song about the Blackwood River, where she grew up in Australia. She asked about our local river, the Stour? So this is about The River Stour tonight. Dear River, a track from the Red Clay Halo days. Blackbird next with some great strumming and Harmonica playing. Track 10 on THE TOERAG SESSIONS with little curtsy at the end. 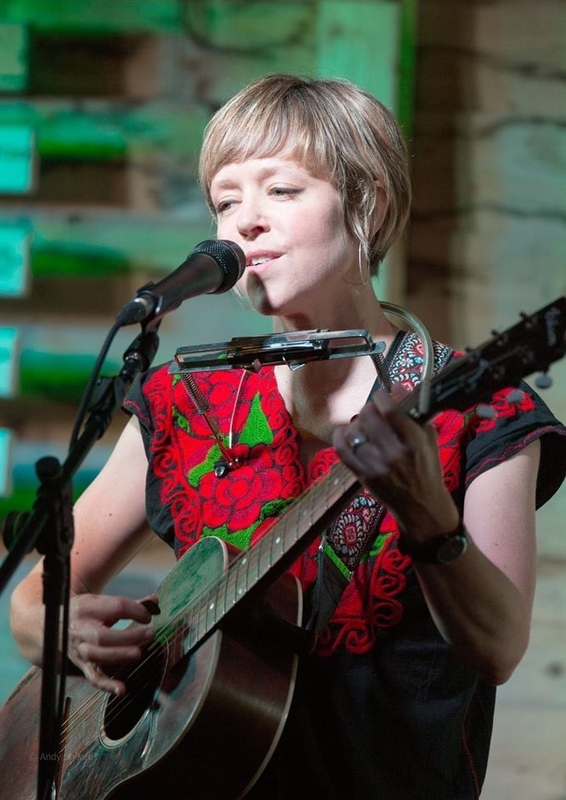 “Back in 2008 when I first came to LRB I released my second record called DESPITE THE SNOW. At the time I emailed my mailing list to book house concerts to help pay for it. At one of these I met the composer Martin Phipps. He later called up to ask me to re record this song as he was working on the score for the BBC 1 Drama Wallander. I knew nothing about the actor Kenneth Branagh or the work of author Henning Mankell. I grew up without a TV in south west Australia. So I had to pretend I knew what he was talking about and said yes. Seated at the piano now Emily tells us that. “In 2016 I went to Memphis to record SWEET KIND OF BLUE with all star local Memphis musicians who have performed with many of the greats. In just 4 days we had it done; the extreme sports of recording”... laughs. This led into Over My Shoulder almost seamlessly... laughs. You had to be there... Again, another Spellbinding song with those Pin Drop moments we all love so much. After a shout out to Emily, Michael and Hollie with Tom. “Who were brilliant”, we have a cover. “I didn’t write it, but I wish I had.” Says Emily. Bruce Springsteen’s Tougher Than The Rest from TUNNEL OF LOVE. Next Emily plays No 5 Hurricane. Track 4 on SWEET KIND OF BLUE. Another beautiful mellow song. Followed by more Harmonica for Disappear Track 4 from THE TOERAG SESSIONS another essential album to own. After more thank You’s we have another song for The Blackwood River, The Blackwood , another RED CLAY HALO song from the DEAR RIVER album. We end on a real showstopper, an old Sister Rosetta Tharpe gospel song Precious Memories... Just Emily and that huge voice, clicking her fingers and holding the entire room transfixed… Simply stunning! A well deserved ovation led to J announcing “Emily has raised the bar to a new level tonight!” When you consider the level we already have, that’s some achievement. Now we had more thank You’s especially to Andy Baldwin who did a fantastic job on the sound. Emily comes back for one more as she tells us about her unremitting tour schedule that led to tonight and finishing with an old song Almanac. Inspired by a poem about human indifference by Primo Levi. As it’s Saturday night, she had us all singing and clapping along in true LRB style. Wow! What a performance, you really do not want to miss any of these shows if you can possibly help it. 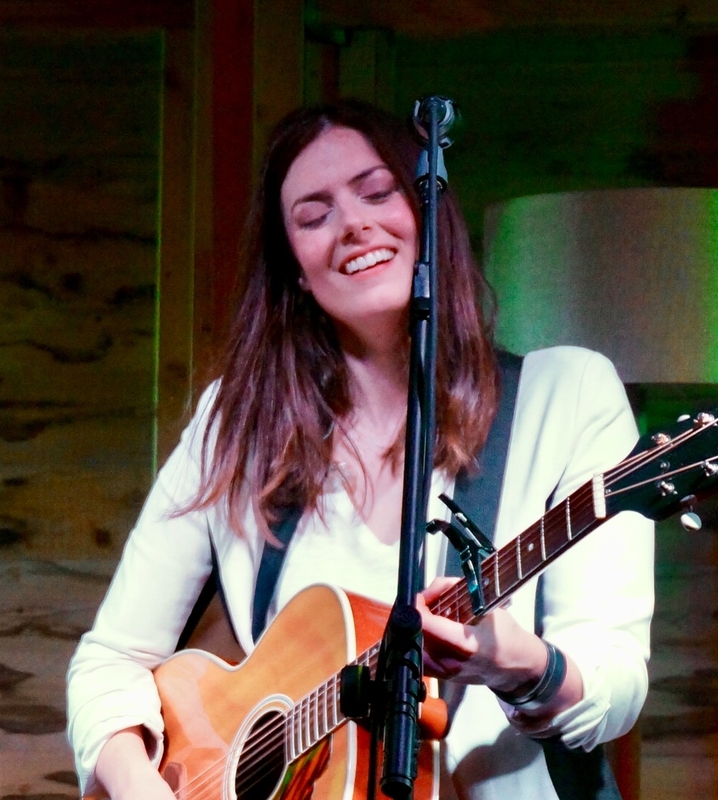 We have an amazing video of Emily Barker at Paste studio NYC as she readies for her Mary Chapin Carpenter tour. Enjoy some of what we had at LRB. 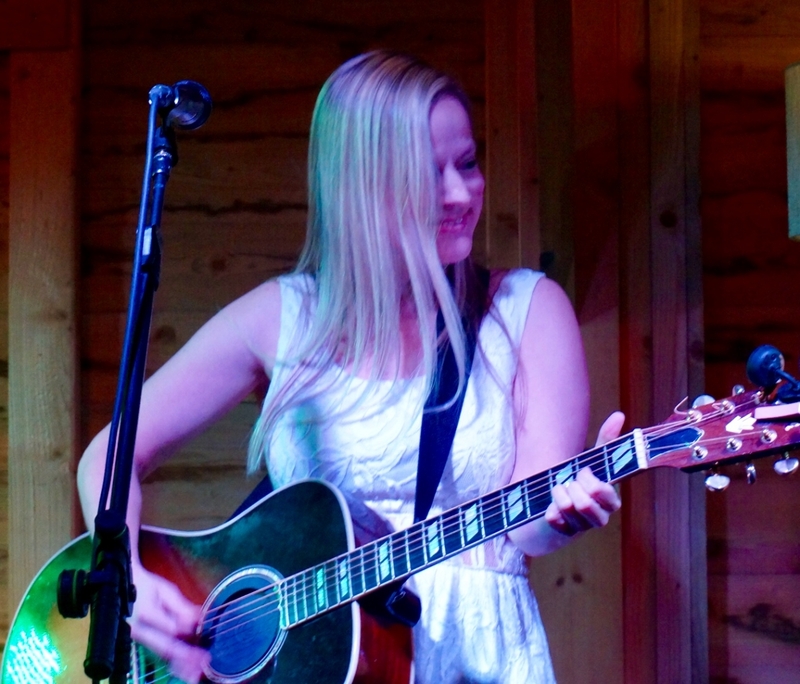 We have some videos from the wonderful Emily Barker gig. Fans of the Wallander BBC TV series will know this song. 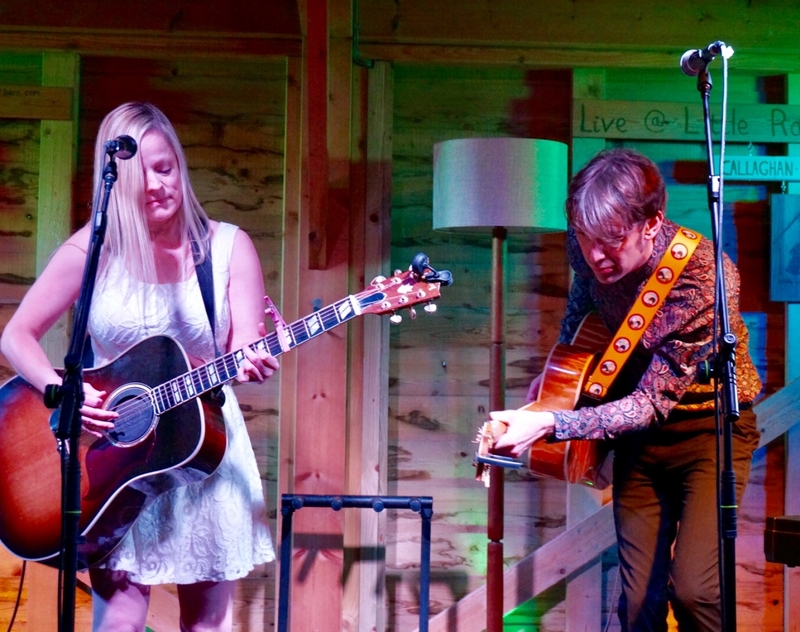 Hannah Aldridge and Cherry Lee Mewis proved to be the perfect entertainment on a hot and balmy summer evening at The Little Rabbit Barn. We even took some of the marquee sides down to provide a cooling breeze; that was a first... The weather was hot, not something we are used to, but the music was hotter and we are getting used to that! First up, Hannah Aldridge after several years of trying to book her. The dates just didn’t line up. 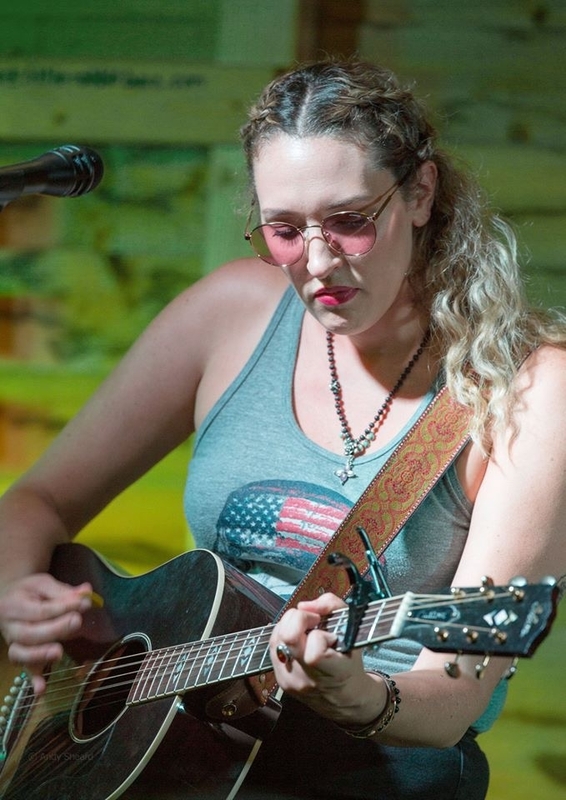 Hannah is from Muscle Shoals and her father Walt Aldridge (not Disney) was recently inducted into the Nashville and Alabama Songwriters hall’s of fame. The next song Razor Wire Hannah told us, was the first song where she dug in deep to write honestly and found her songwriting voice. “It was intimidating to write but was also liberating. I decided that if I didn’t go and write a song that meant something it wasn’t worth going out and playing at all”. “I was raised in a very religious household but with electricity, because you don’t want to be inconvenienced too much...” laughs, “and I’ve been recovering from that for the last 30 years.” More laughs... 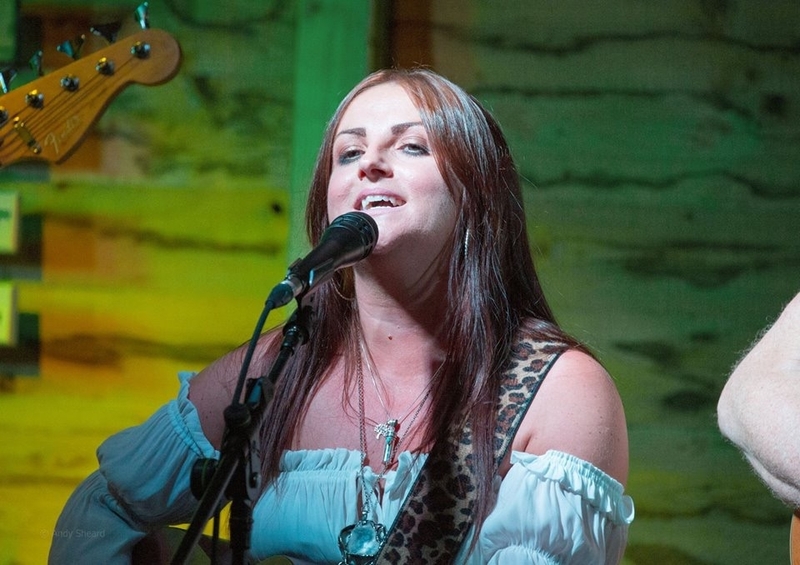 So from that, Lace written in conjunction with Ashley McBryde is next. Based on discussions about demon possession and the seven deadly sins, the battle between good and evil. Track 9 on GOLD RUSH. “My favourite song on GOLD RUSH”. You can tell she is enjoying performing these songs by the energy she puts into it. Amazing! Hannah tells us, a guy she dated asked her to write a song for him, but he continued to see his ex girlfriend. “So I took the opportunity to write this song, it’s a good way to get rid of someone, you should try it”. Laughs... Old Ghost Track 2 on RAZOR WIRE. Parchment next based on Hannah’s experience of meeting women on death row and hearing their stories. She tells of how it feels when people express thanks and appreciation for a song. “You realise you’re not just writing a song in your bedroom anymore”. Track 5 on GOLD RUSH. We learned from Hannah about writing for movie scenes where you are given scenarios and key words to fit in. This is how the next song was written with Jordan Dean (who produced GOLD RUSH) on Halloween and is Track 11 on RAZOR WIRE. Save Yourself. “I’m going to record it on my live album at the Lexington soon”. Well, after Hannah finally having met the Rabbits and whilst playing the Little Rabbit Barn we get to You ain’t worth the Fight. Track 1 on RAZOR WIRE. We enjoyed some off mic singing too and I am sure you could hear at the back as Hannah has such a powerful voice. She sings like she means it. Another song written in conjunction with Ashley McBryde after spending time contemplating getting older, the title track from GOLD RUSH. These songs are spellbinding in a way that you lose track of time. “My dad, a country music songwriter, is a big influence on me and I was asked to induct him into the Alabama Songwriters Hall of fame. I asked myself what is my favourite song he has written? He has written so many songs that have never been recorded. This song is about a rebel soldier who returned to find all his life had gone; so he did all he knew and took a pistol and a horse and rode off to rob a Yankee Bank to get back what was his.” Yankee Bank. Lonesome closes the set on a pin drop moment... well, it would have but Hannah segued into performing Judgement Day for a big finish with a huge appreciation from everyone lucky enough to have been in the room tonight. We have been privileged to enjoy another truly great artist at Little Rabbit Barn. Now is the time for food and also for people to enjoy the lawns on a beautiful summer evening as is the way at LRB. Lyn and her team worked miracles with Coronation Chicken and an exclusive vegetarian version of the same. The calling out of the Raffle signals that the stage has been re set and it’s time for more music. 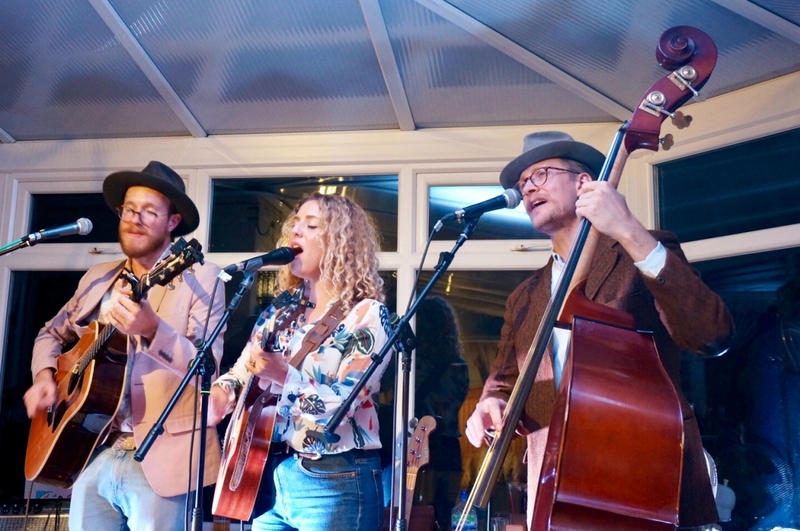 Cherry Lee Mewis and her amazing band of Max Milligan on Guitar. Robbie Stewart-Mathews on Bass. Brian Green on Drums and sitting in the corner we find Lee Vernon on Harmonica. Luckily we didn’t have to send a private jet to pick her up like they did recently in Norway... But this goes to show the lengths people will go to for a Cherry Lee Mewis Band performance! The band started with a great extended electric guitar solo from Max Milligan as Cherry sang Shake That Thing. Track 2 on SOUTHBOUND TRAIN. The little Rabbit Barn is in party mode now. A great harmonica solo from Lee complimented Max’s solo. 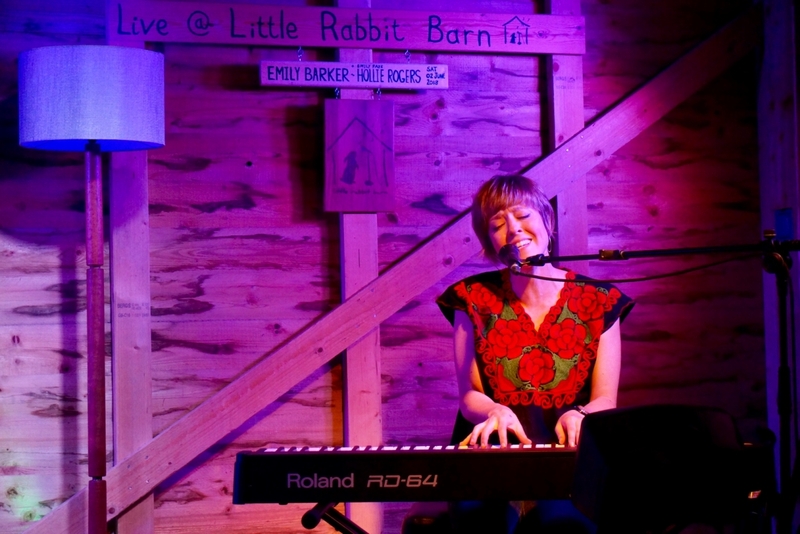 Cherry remembers that it was 2012 when she last played the Little Rabbit Barn having recorded three more albums in the interim. This is a welcome return. Max is now on acoustic as the band launch into the next number, Things Change. Meet Me At The Station quickly follows, another uptempo foot tapper finishing with some lovely harmonics from max. Lee Vernon is introduced (Sitting in the corner) at this point. He is tall in relation to Cherry, so chose to sit on a stool so as not to hog the lime light... Cherry took to her guitar for this song also. Come Back Home is next, The opening track from her latest album VOYAGE, a song where the LRB crowd were happy to sing along. “Keep Lubricating” Cherry implores us. Cherry, back on the very guitar this next song was written on, which we failed to amplify. “Its OK, I need to practise anyway” she says to laughs all round. Living The Dream an uptempo catchy ironic number Track 3 on VOYAGE. Stan was called on to control the fan at this time, the price he had to pay for a front row seat. He really is living the dream. Cherry tells us about living near the old Bedford Jail and what a great UK music hub Bedford is before losing the mic stand and launching into Memphis Tennessee another more well known musical hub. More fine Guitar from Max that drew applause mid song. Max and Lee lead us into Hey Hey Hey Track 2 from CATCH MY DRIFT. Max takes on more great guitar solos and more applause as the LRB crowd join in. Brian’s drumming and Robbie’s Bass are really driving a tight groove throughout, this is a very tight band. Some guitar boogie now from Max as he leads the band into Western Star. Track 12 from SOUTHBOUND TRAIN Cherry’s 2009 album. 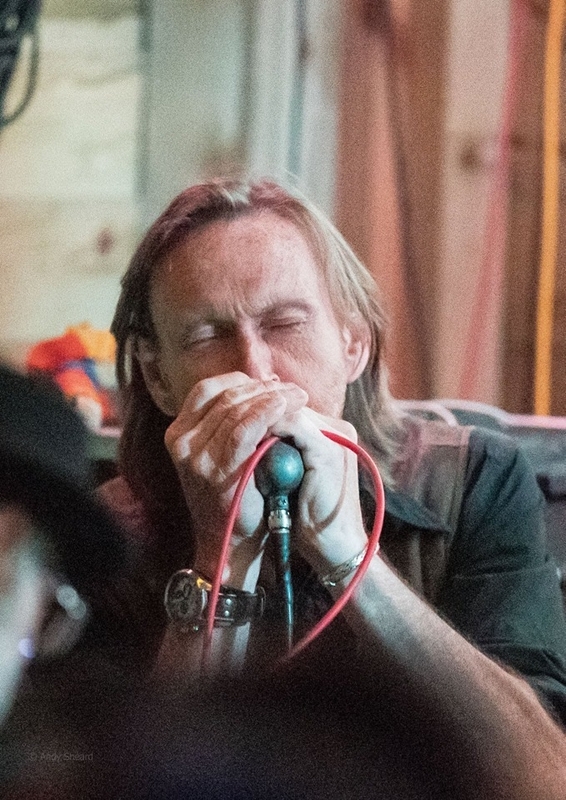 Lee alternates solos on Harmonica with Max on guitar for some more high energy boogie. “Shall we do another new one? Cherry asks. Well if you haven’t seen us before they are all new” she concedes. Max shouts out for the wonderful Hannah Aldridge to a very well deserved applause. Apparently, we need warming up now? (You think?) so with Max still on Telecaster we get Love Me With A Feeling. 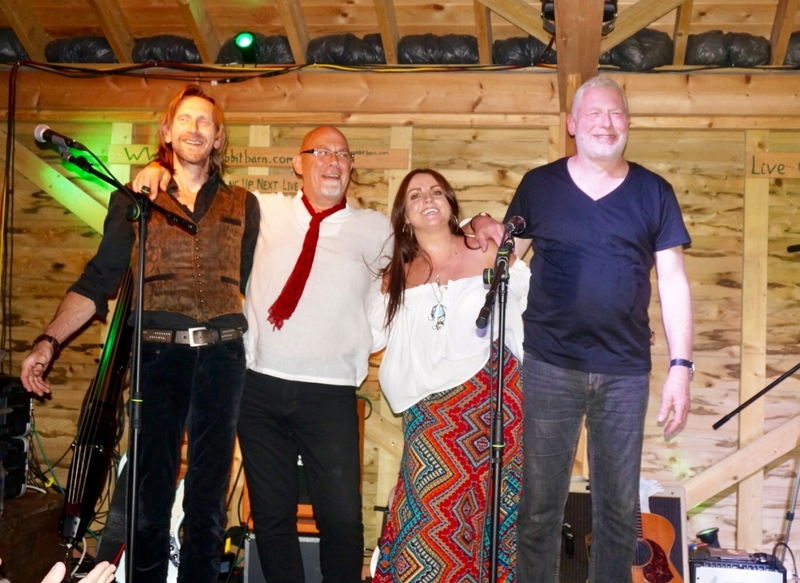 More uptempo Blues and another chance for Lee Vernon to shine on Harmonica as Cherry gets him standing centre stage so we can all see him as well as hear him play. I keep saying this, but if you come to LRB, you’re in the band. Cherry wine, to close the show (a favourite tipple of Cherry’s) is next keeping up the pace. A great opportunity for solos from all the players in turn. Lee, Harp. Robbie, Bass. Max/Cherry trading riffs and Brian on the Drums. Wow! We couldn’t leave it there though, so after a few thank yous Max allowed Cherry to play his beloved acoustic guitar ‘with stern warnings’ as we enjoyed another song from the new album VOYAGE How I Fell Out Of Love, followed by a group bow although Brian missed it being trapped by his snare. James and Cris did a fine job on sound for what was an evening of two halves when you consider musical styles. All these artists are at the top of their game though and from the feedback I have received I don’t think anyone was disappointed. Marvellous. Edited by ChrisLayerUK; 2018-07-26 19:37. Happy 60th lol. I had the perfect treat of Lauren Housley with Thomas Dibb on Guitar and Mark Lewis on Double Bass playing two sets in our Conservatoty. That should spell conservatory Freudian slip lol. J from the LRB supplied the PA and Cris the sound engineer. Edited by ChrisLayerUK; 2018-08-13 21:46. Generated in 0.024 seconds in which 0.004 seconds were spent on a total of 16 queries. Zlib compression disabled.